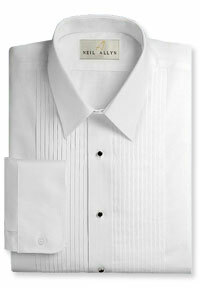 Formal Shirt with a Multipleat front, 65% polyster/35% combed white cotton . Stud or button closure, barrel cuff - accepts cuff links Specify collar size and sleeve length. *Shirt Studs & Cufflinks sold separately.